Overwhelmed? Lost? Alone? We are here to help as you begin your food allergy journey. Did your child receive a diagnosis following a severe allergic reaction? Or, was your child finally diagnosed after months of unexplainable tummy problems, rashes or formula switches? Either way, we know that the adjustment to living with food allergies can be overwhelming. Our website offers you a rich and trusted source for information you need to learn how to read labels, and to serve safe foods. In addition, you can learn how to prevent allergic reactions and treat a reaction should one occur. Our award-winning online support community and our national network of local support groups will help you connect with others so you do not feel alone. One in 13 kids has a food allergy. A food allergy occurs when the body's immune system sees a certain food as harmful and reacts by causing one or more symptoms. This is known as an allergic reaction. Foods that cause allergic reactions are called allergens. Even a tiny amount of an allergen can cause a reaction. Allergic reactions usually occur after your child eats a food that she or he is allergic to. The most common food allergies in infants and children are eggs, milk, peanuts, tree nuts, soy and wheat. Children may outgrown some allergies (egg, milk and soy) but may be less likely to outgrow others (peanut, tree nuts, fish and shellfish). Your child's doctor will give you a complete list of possible symptoms. This list of symptoms is also on your written food allergy emergency care plan. Your child's doctor will need to diagnose food allergy based on your child's symptoms, medical history, physical exam, and test results. The doctor may recommend your child see an allergy specialist to further diagnose and treat the allergy. 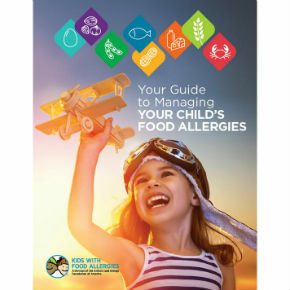 Have a written food allergy emergency care plan, also called an anaphylaxis emergency action plan. Your child's doctor will give you this step-by-step plan on what to do in an emergency. Learn how to give your child epinephrine. It's the medicine of choice to treat an allergic reaction or anaphylaxis. Epinephrine is safe and comes in an easy-to-use device called an auto-injector. It injects a single dose of medicine when you press it against your child's outer thigh. Your child's health care team will show you how to use it. Always have two epinephrine auto-injectors near your child. Teach people who spend time with your child how to use the auto-injector device. Consider having your child wear or carry a medical alert bracelet to let others know of the allergy. Follow the steps in your child's emergency care plan to give your child epinephrine right away. This can save your child's life. After giving epinephrine, always call 911 or a local ambulance service. Tell them that your child is having a serious allergic reaction and may need more epinephrine. Your child needs to be taken to a hospital by ambulance. Medical staff will watch your child closely for further reactions and treat him or her if needed. Learn how to read food labels for ingredients your child is allergic to. Read the label every time you buy a product, even if you've used that product before. Food ingredients in any given product may change. Ask about ingredients in foods that other people make for your child. Avoid passing allergens to foods that are safe for your child to eat by washing your hands and your child's hands with soap and water before handling food. Prepare and serve foods with clean utensils and other kitchen items and on clean surfaces. Educate family, friends, and others who will be with your child about your child's allergies. Be sure to tell your child's school and anyone responsible for your child about his or her food allergies. Teach your child how to manage his or her food allergies. You can start teaching your child even at a young age. When old enough, teach your child to read labels. Also teach your child how and when to use an epinephrine autoinjector, and to tell an adult if he or she is having an allergic reaction. After the diagnosis, focus on what safe foods your child can have, rather than what he or she can't have. Start with plain foods with simple ingredients. From there you can look for new recipes that use safe ingredients. Reviewed by medical advisors January 2014.